It certainly feels like I've been pregnant forever (and I have, haven't I?) but we're finally approaching the home stretch. 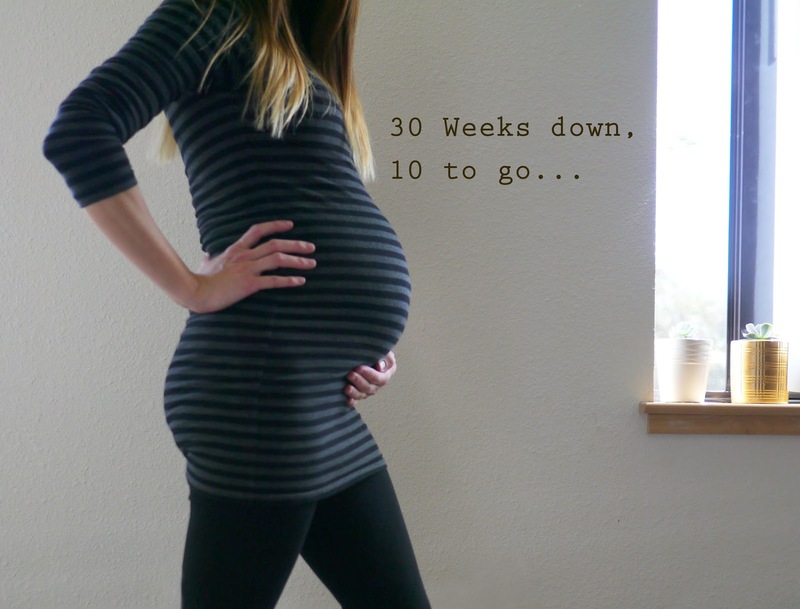 Thirty weeks down, just ten more to go! However, when I think about all the things that I'd like to get done before baby number three comes along it feels like those ten weeks just aren't enough. I'm certainly not prepared in any way for the upcoming birth. We haven't even discussed names, apart from those that Lola has come up with: Christmas Tree Jack-O'Lantern Mason is a little long-winded, but Cleverly Mason has a nice ring to it! Let's not even think about where she got Furry Johnson Mason from though! We haven't worked out any of the logistics for when it's time to go to the hospital. Where do we send the kids? How do we get them there? What if they're at school/swimming/karate/ballet? How do we get them to school in the morning if I go into hospital overnight? What if Kim's at work - an hour and a half away by train? How do we get to the hospital without a car? And how do we ensure that we make it to hospital before it's too late for that epidural that I desperately want, no, NEED? The last bit is the scariest. And it's the bit that we have the least control over. All of our baby gear is in storage back in Australia (or was sold before our move) so it all needs to be purchased again. The recent sales at Gap have certainly helped fill the closet in the girls' room with tiny onesies but there's still so much more to organize. Swaddle blankets, wraps, Grobags, stroller inserts, nursing bras, nursing tops, baby bouncer, bassinet, a replacement for our well worn (ie. broken) stroller... and of course, that baby car seat which is legally required in order to leave the hospital even though we don't own a car! And where are we going to fit all this stuff in our small apartment? We haven't made any space for the baby yet. She'll sleep in our room for probably the first six months but we haven't worked out where we'll fit her bassinet/crib. Some serious reorganization of our apartment needs to happen. When I was pregnant with Lola we stressed over where we'd put everything that was in the spare room/study so that she could have her own bedroom. This time around we'll have three kids in a two bedroom apartment rather than two kids in a three bedroom house. The idea of our kids each having their own bedrooms now seems so extravagant but felt so important when I was pregnant with Lola. And then there are all the things that I want to do and places I want to go with Ava and Lola before the baby comes along and they inevitably feel a little left out. Ten weekends (at most) doesn't sound like that many when I think about how I'll try to squeeze all these activities in. I guess some things will just need to be postponed if we don't get around to them. Can you tell I'm starting to get a little anxious? So much to do, so much to organise and with each passing day there's less and less time. I think part of me still doesn't really believe that there will be a baby at the end of all this so I haven't seriously thought about getting organised even though I know I need to. I put off buying baby clothes for the longest time so as not to jinx myself - crazy, I know. Everything has a way of working out in the end and I know that when the big day comes we'll make it all work, whether we're ready or not. Oh, look at that... Five minutes has passed. Time for another toilet break! Oh this was me just a few weeks ago! I felt the same way! My husband and I made a list and tackled a few things each weekend and now I feel a lot better! Our boys will be sharing a room and I had a good cry about the room being decorated only for Jude - I still need to work on that one but my husband reminded me that babies don't care, thank goodness! Sending you hugs, here's hoping that once you get this settled the last bit flies by! I've gotten tons of good stuff at swaps like this. I have clothes for my two year old to fill her closet until she's four and lots of gently used books and toys. You can find stuff for the new baby and Ava and Lola. Hang in there and good luck! Thanks for the tip. I'll have to check it out. I heard it was a bust and not a lot of good stuff. Hope you didn't go out of your way! Oh, I wanted to ask you, how did you deal with jet lag with your little ones traveling abroad. We may go to Thailand for a week next year and a little wary. Thanks! We didn't end up making it there on Sunday. Regarding jetlag, we've been really lucky that our girls haven't really suffered from it much. One thing we definitely try to do is get our body clocks adjusted to the new time zone as quickly as possible. It's tempting to go straight to bed after a long flight but if it's not bedtime then it's best to stay up no matter how tired you might be. This was always tricky flying from Australia to the UK as for some reason we would always arrive in London around 5am - after 24 hours plus flying! If you can get a flight that arrives later in the day it may be easier to manage.